The founder of Pirika Chocolate Co. was John Randolph Stout (1851-1923). He was born 10 March 1851 in Kingston, Wisconsin, and died 27 February 1923. The 1900 U. S. Census recorded John R. Stout, age 49, born Wisconsin, March, 1851, living at 110 Kingston Avenue, in Brooklyn's 24th Ward. He lived with his wife, Kate, born Pennsylvania, and three sons, George C., Walter R. and Oscar M. Of his sons, George was a musician, Walter was a salesman (confectionery), and Oscar, age 13, at school. By the time of the 1910 U. S. census, John R. Stout lived at 1328 Pacific St., Brooklyn. Of his sons, only Oscar, age 23, lived at home. His occupation, like that of his father, was "confectioner." Pirika Chocolate was formed in 1898. It was listed in the Lain & Healey Brooklyn City Directory of 1898 when located at 451 Bergen St. They moved to Dean St. in 1902. The business failed in 1925 for reasons unknown. Two internet blogs contain interesting information about Pirika Chocolate, brownstoner.com and ilovefranklinave. This letterhead from a letter appended to John R. Stout's passport application in 1918 listed numbers 964 through 974 Dean St. for the Pirika Chocolate Co. A similar letterhead a year later listed John R. Stout as founder, while the new officers were his sons, Walter R. Stout (1880-? ), Oscar M. Stout (1886-1972) and George C. Stout (1874-1922). According to Columbia University's listing of bids submitted by the New York Architectural Terra Cotta Co., the Pirika Chocolate Co. factory was constructed in 1914 to designs by the architect Theodore Engelhardt. "Theodore" Engelhardt is possibly Theobald Mark Engelhardt (1851-1935), the architect of the Brooklyn landmarked Ulmer Brewery (1885) on Belvidere St. near Bushwick Ave. This 1914 structure, however, seems to have been replaced in 1920 by the existing building (see below regarding Pirika's stock offering in 1925). 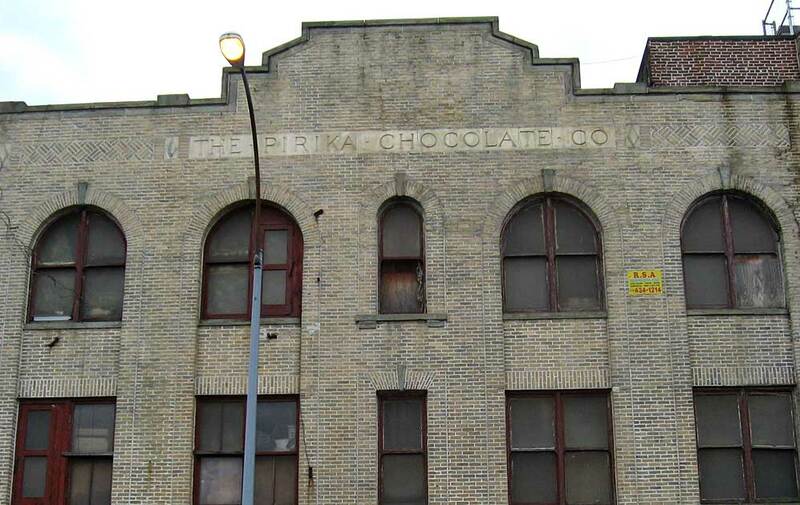 In 1919 the New York Times, 20 April 1919, reported, "The Pirika Chocolate Company has acquired additional property in Dean Street, near Carlton Avenue, and has commissioned Timmis and Chapman, architects and engineers, to prepare the plans for the new factory to be erected on this site. The building will be a three-story structure of reinforced concrete construction, 75 by 120 feet. The cost is estimated to be approximately $125,000." This ad for Pirika appeared in the Pictorial History Section of the Brooklyn Daily Eagle's 75th Anniversay issue, 26 Oct. 1916. In December 1919 this classified ad for Pirika appeared in the New York Times. In May 1921 this ad for Pirika appeared in the journal The International Confectioner. This ad for Pirika appeared in Everygirl's Magazine, Feb. 1923, p. 197, urging Camp Fire Girls to sell Pirika chocolates. An advertisement for Pirika stock in Feb. 1925 contained the following: "The Pirika industry was founded in 1898 by the present management. The Company was incorporated in 1918 under the laws of the State of New York for the manufacture and sale of Confectionery, Cocoa, Chocolate, etc. The Company started with $500 capital, operating in a small building. Solely on the extraordinary merit of the product itself with practically no advertising or special sales effort, Pirika has become one of the big factors in the candy industry today." Also, "Pirika Products are manufactured in the Company's own factory, which is located at number 964-974 Dean Street, Brooklyn, N. Y. This thoroughly modern three-story and basement, with mezzanine, concrete building was erected by the Turner Construction Company and completed in December, 1920. The factory contains more than 35,000 square feet of floor space, with 20,000 square feet of additional space in an adjoining building. The factory's capacity is in excess of fifteen tons of candy per day." A story in the New York Times, 4 April 1925, says that Pirika became bankrupt on 9 March 1925 and that the company "was in bad financial condition for at least six months before the petition in bankruptcy was filed." Petitions in bankruptcy as individuals were filed against Walter R. Stout and Oscar M. Stout 7 April 1925.